The golden age of ocean liners is inextricably linked with the key decorative trends of the 20th century Art Nouveau, Art Deco, and Modernism. This lavish visual feast explores the technical, aesthetic, cultural, and political factors that came together to define such an iconic mode of travel. A detailed look at the statuettes of the Art Deco period, and the artists who created them. 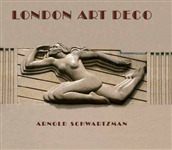 For this survey of London's rich trove of Art Deco treasures, the author has photographed not just landmark buildings like the Savoy Hotel and the Hoover factory but also department stores, cinemas and theatres, Underground stations and many other buildings in which stunning exteriors or interiors survive. 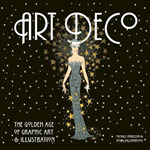 Focusing on Art Deco graphic art and illustration, this coffee-table book features fascinating text on the movement in general, fashion and advertising, accompanied by beautiful reproductions of work by talents such as Barbier, Erte, Cassandre and Colin. Echoing examples of other forms of Art Deco are also included. By the time of the Paris exhibition of 1925 from which Art Deco took its name, the idea that an interior and its furnishings should form a "total look" dominated design. This text displays the flourishing design ingenuity with photographs and illustrations of interiors and individual pieces.